Diamond Bullnosing asked Moulding Masters to dress up their show room. Mark Benda was given free rein to use trimwork, tile flooring and textured and wragged paint on the walls. The contrast between the beautiful colors and textures of the stone with the clean, crisp lines of the moulding is very pleasing. Large cornices over the doors and displays, custom treatment of the columns, breaking them into segments with moulding at the mid height, give the showroom a look of richness without being overly formal. Doorways were framed in and topped with pediments. Columns were dressed up with bead board with a crown half way up the column. Diamond Bullnosing is a fabricator/installer for granite slab projects. 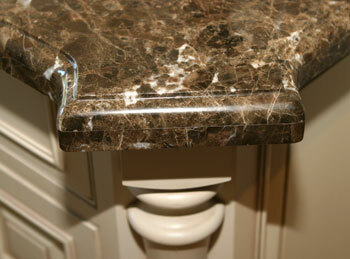 They produce beautiful granite kitchen counters like the one below. 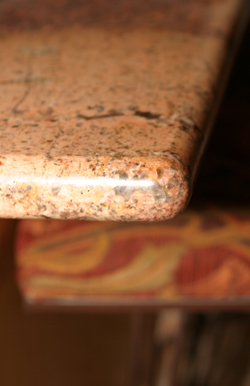 In addition to its beauty, granite is the second hardest surface on earth (second to diamonds.) This makes it both bacteria and scratch resistant when properly sealed. 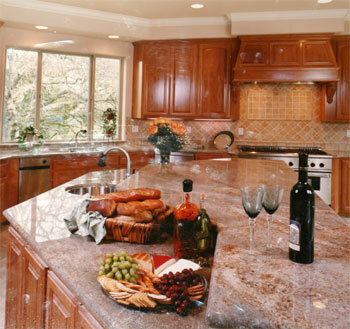 Granite kitchen countertops are the number one American remodeling project. 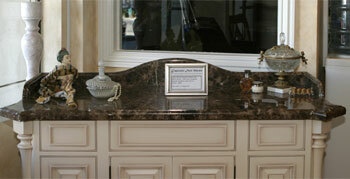 Granite is a beautiful choice for countertops, bathroom vanities, fireplace surrounds, showers, table and dekstops. 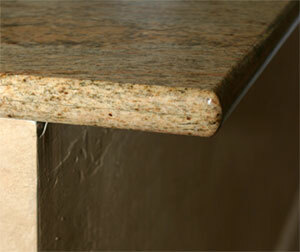 Granit window sills are now becoming a popular finishing touch to add character to modern homes. 1. Fabrication and Installation of custom natural stone (marble, travertine, slate and limestone) countertops, vanities, tub surrounds, showers, fireplaces and custom furnishings. 4. Removal of existing countertops. Diamond Bullnosing asked Moulding Masters to dress up their show room, selecting large crowns and custom columns shown below to offset the beautiful colors and textures of the stone. Tile floor, 12 inch baseboard, dressed up columns, granite desk top, wragged and textured walls - create a beautiful selling environment. 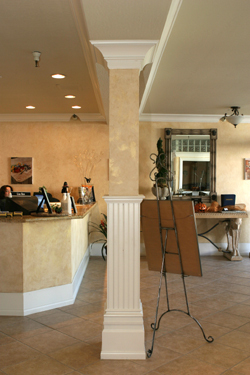 The front desk of the show room has a granite top. The column treatment is ingenious - showing a two tone version above right and a solid color version above left. An office area is separated from the showroom using glass doors - allowing view of the showroom activities, but providing a sound barrier. Above: Double Beaded Crown is used in this installation. Click here to see Double Beaded Crown MM 124 in our catalog. 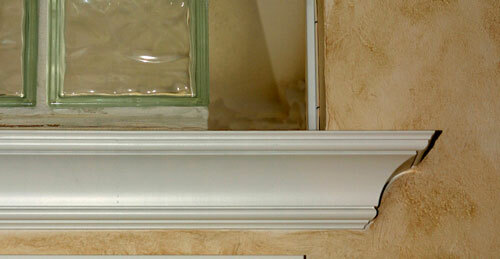 Jobs usually have problem areas which owners think eliminate moulding as an option. 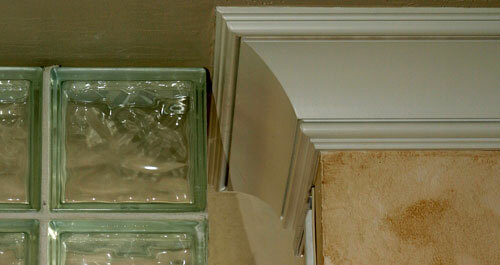 The question arises of how to end the moulding, or how to integrate it with another feature, such as the glass brick shown above. Owners who think they will not be able to use molding in a room because of some issue will actually find the problem area to be one of their favorite features. 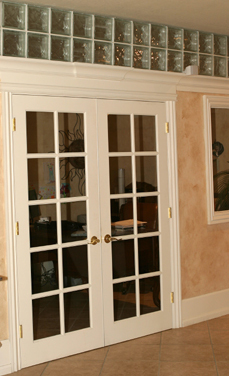 Moulding endings can provide architectural touches - adding detail and interest. 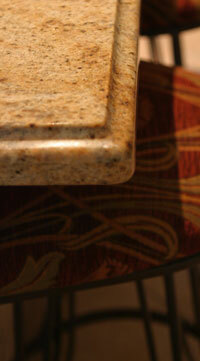 Notice how moulding is enhanced by contast - the color and texture of the stone as well as the wragged textured walls. Here are samples of edges done at the Diamond Bullnosing shop. Edges are created on an computerized machine using laminated layers of stone. The edges are precision cut, highly polished and ready for installation. Here we see a more ornate use of the granite, with curved edges on the bureau top and back board on a traditional style bureau. 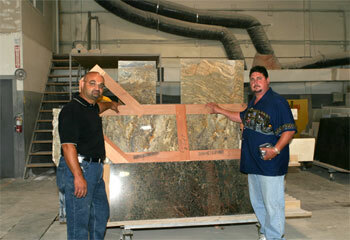 Diamond Bullnosing Owner and President Dominic and Mark Benda with a template and a selection of stone - an exotic import from Australia is seen at the bottom. A gantry saw or bridge saw is seen in the back of the photo.